Epps was the leading brand of cocoa in Victorian Britain. James Epps (1821 – 1907) was the son of a Calvinist London merchant. His brother, Dr John Epps (1805 – 1869), was one of the pioneers of homeopathy in Britain. He established premises at Great Russell Street, Bloomsbury, and was joined by his brother James from 1837. Epps’ cocoa was first sold from 1839 for the use of patients for whom tea and coffee were restricted. It was an instant cocoa powder, made by adding hot water or milk. The almost prohibitive duty on cocoa was greatly reduced in 1832, allowing the market to grow exponentially. Easily prepared cocoa had been difficult to procure, and the fat in the raw material was unpalatable for many. Dr John Epps discovered a way to make it more appetising, mixing the cocoa with 20 percent West Indies arrowroot and 13 percent sugar. Dr John Epps was not the first person to invent soluble cocoa powder, but James Epps was largely responsible for presenting the product to the mass market. He heavily advertised Epps’ Cocoa, and by 1855 had coined a distinctive slogan, “grateful and comforting”. Epps’ Cocoa was initially produced under contract by Daniel Dunn of Pentonville Road, who had invented instant cocoa powder in 1819. 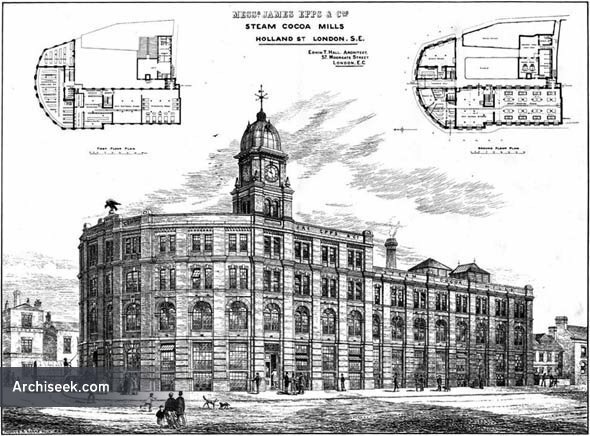 Epps had established his own factory at 398 Euston Road, London by 1863. He installed his nephew, Hahnemann Epps (1843 – 1916), as manager. A new steam-powered works was established at Holland Street, Blackfriars in 1878. Epps was the largest cocoa powder producer in Britain, with an output of nearly five million pounds a year. At its peak the firm processed half of all cocoa imports into Britain. A short and slight man, James Epps kept a low public profile, unlike his gregarious brother John. He was known only for his work in business, and had few outside interests. He allowed his portrait to be taken only once, and not once did he grant an interview or issue a public statement. He was a hard worker, keen on a bargain, and somewhat controlling. Despite his massive wealth he lived in an unfashionable area of London. The business was converted into a private joint stock limited company in 1893 known as James Epps & Co. 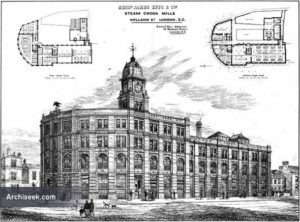 The directors were James Epps, Hahnemann Epps and James Epps Jr (1856 – 1905), and the company had a capital of £200,000. The company remained under family control, and no shares were offered to the public. Epps’ Cocoa had been overtaken in sales by Dr Tibbles’ Vi-Cocoa and Rowntree by 1898. James Epps Jr (also known as Willie James Epps), the only son of James Epps, died of a heart attack in Jamaica in 1905. His gross estate was valued at £162,422. James Epps died in 1907 and his gross estate was valued at £735,387. This was a larger estate than contemporaries in the food industry such as Jeremiah James Colman (1830 – 1898), Alfred Bird (1849 – 1922) or James Horlick (1844 – 1921). The estate was inherited by his nieces and nephews, principally James Washington Epps (1874 -1955). Hahnemann Epps became chairman and James W Epps became managing director of James Epps & Co.
Taylor Brothers Ltd, a London cocoa manufacturer, was acquired in 1907. Epps’ Cocoa powder had been reformulated to include 44 percent sugar, 40 percent cocoa and 16 percent West Indies arrowroot by 1924. James Epps & Co was acquired by Rowntree of York in 1926 for £70,000. The Epps factory was closed in 1930, and the manufacture of Epps products was transferred to Whitefields Ltd of Plaistow.